We have put together a selection of frequently asked questions about the Lean RCM™ Award and qualification process. If you have any queries that are not covered below please get in contact with us and we’ll be happy to help. What is a Lean RCM™ Qualification? EMS Cognito’s Lean RCM™ process combines world-class methodologies from the automotive and aircraft industries and is used for optimising the reliability of asset-intensive processes. This customised award will help EMS Cognito customers increase skills levels in their workforce. Because they are competency-based, they also allow the customer to demonstrate that its people are competent and can do everything their customers will ask of them. Certificate 2 – Lean RCM™ Practitioner – this qualification demonstrates an individual’s ability to apply Lean RCM™ theory, improving asset reliability and productivity. Why has the Lean RCM™ Qualification been introduced by EMS Cognito? Whilst there are several vocational qualifications in place for Lean Manufacturing, EMS Cognito observed an absence of any such awards which recognises reliability best practice skills and knowledge and in particular, Reliability Centred Maintenance. The absence of such an award until now is surprising considering the growth in the number of employers in manufacturing and other industrial sectors demanding high-calibre engineering, maintenance and operations professionals with knowledge of these best practice skills. By introducing this award, EMS Cognito has provided the standard for employers to measure current and potential employees to ensure their teams have the skills and competence to deliver world-class asset performance. What are the benefits of gaining the Lean RCM™ Qualification? How is this Qualification recognised? The Lean RCM™ qualification is a customised award assured and accredited by the SQA. This external verification by a respected and renowned qualifications authority guarantees a robust process is consistently and fairly applied in all situations across all industrial sectors. The award is Credit Rated on the Scottish Credit and Qualifications Framework (SCQF), formally recognising the level and credit points of the qualification. The SCQF rating system is compatible with other qualifications rating systems in the UK and allows employers to understand the complexity and volume of learning material involved in achieving the award at each level. Already, before its official launch, EMS Cognito has customers in many industries including; Food Manufacturing, Water Industry, Waste and Recycling and Automotive Industry with employees actively participating in programmes to gain this qualification. Some of these companies are planning to introduce this qualification as a requirement in their internal progression systems for operations and maintenance personnel. Over the past 2 years, in the development of this qualification, EMS Cognito has observed a strong demand within its customer base for this type of qualification. As a result, we fully expect, over time, that the qualification will become an established and recognised standard for companies operating in the manufacturing and industrial sectors. Why are there 3 different levels of the Qualification? Most companies, depending on the size, will have the need for a few individuals qualified to Lean RCM Facilitator however many more employees will be involved in applying the Lean RCM™ process. Some of these employees will require some basic knowledge of the process in support of the day-to-day activities whilst others will be involved in the analysis and implementation of Lean RCM™ under the guidance of a qualified Lean RCM™ Facilitator. Certificate 1 – Lean RCM™ Theory: Providing the theory and background of Lean RCM™ intended for individuals who will be involved in day-to-day operation of autonomous maintenance processes derived from the Lean RCM process. In terms of the level of difficulty, this level of the qualification broadly equates to GCSE and can be achieved by passing a written theory test following a 3-day training workshop. Certificate 2 – Lean RCM™ Practitioner: A demonstration of an individual’s understanding and competence in applying the Lean RCM™ process to improve the reliability of an asset. This level of the qualification is comparable in difficulty to elements of an HNC. To gain this award requires participants and in a 15-day Lean RCM™ Masterclass programme of an approximate 3 month period. What happens if a candidate fails an assessment? The following table sets out the process for reassessment of a candidate following failure at any certificate level. What is a Lean RCM™ Facilitator able to do? A Lean RCM Facilitator is able to facilitate Lean RCM™ Masterclass programmes to improve reliability and productivity. Train and coach others in Lean RCM™ at Certificate 1 – Lean RCM™ Theory and Certificate 2 – Lean RCM™ Practitioner in preparation for assessment for the qualification. Support the development of other prospective Lean RCM™ Facilitators by co-facilitating Lean RCM™ programmes with them in preparation for assessment at Certificate 3. 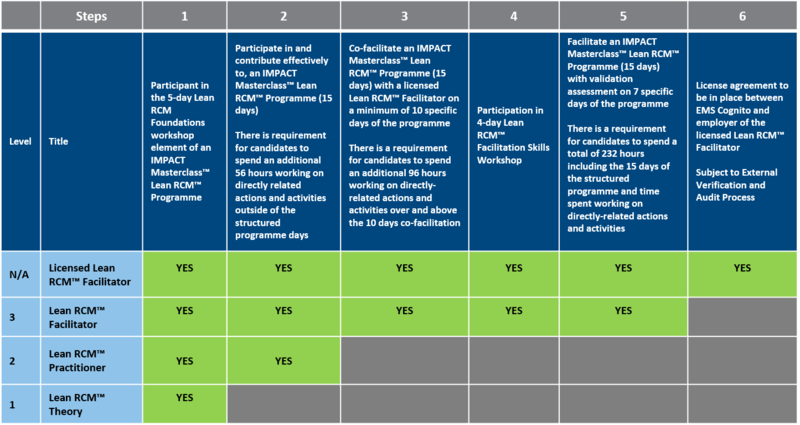 Are there any materials available for a qualified facilitator to use to deliver an IMPACT Masterclass™ Lean RCM™ Programme? EMS Cognito will provide electronic copies of its copyright Lean RCM™ materials, methods and templates to a customer site, under a single site licence agreement, for use by the Lean RCM™ Facilitators to deliver IMPACT Masterclass™ Lean RCM™ Programmes. These materials will be provided free of charge for those who have been trained by EMS Cognito Ltd through its IMPACT Masterclass™ Lean RCM™ programmes. How can a site develop a Lean RCM™ Facilitator in the absence of the opportunity to run a IMPACT Masterclass™ Lean RCM™ programme at one of its operational sites? Participate in an IMPACT Masterclass™ Lean RCM™ programme at another EMS Cognito customer to gain Lean RCM™ Certificate 1 and Certificate 2. Co-facilitate an IMPACT Masterclass™ Lean RCM™ programme at another EMS Cognito customer as part of the requirements to gain Lean RCM™ certificate 3. Costs would apply for each of the above items depending on individual circumstances. What further support will be required from EMS Cognito?